President's Message | GIKEN LTD. In January 2016, GIKEN celebrates its 49th anniversary. GIKEN was founded to extinguish construction pollution recognised as a major source of environmental contamination at that time. In 1975, GIKEN released the press-in machine, “Silent Piler”, first in the world. Since then GIKEN has consistently been developing machines and construction solutions based on the superiority of the “Press-in Principle,” having been accumulating impressive results worldwide. We have been working hard to realise “New-born Construction Industry” for a new era. At the heart of this is a “Construction Revolution”. It destroys conventions of the old construction industry and forms ideal state of the construction industry from tax payers’ point of view. We have defined these basic principles as the “Five Construction Principles”, consisting of (1) Environmental Protection, (2) Safety, (3) Speed, (4) Economy, and (5) Aesthetics. We have consistently been calling for these five principles to form a well-balanced pentagon. Any construction solution that satisfies the Five Construction Principles with well-balanced pentagon should be regarded as the selected solution based on the unconditional “Construction Solution Selection Criteria”; however, in reality solutions tend to be solicited by considering if there is any actual result so far or simply reputation of a company in a vicious circle. Well established ideas or illogically vested interests such as “I don’t see any value without seeing it” or “I don’t want to use any solution that I have never used before” are deemed to be correct, leading to refusal to try new solution or new equipment. This approach causes the industry to be exhausted and hinders the development. I believe that any construction solution has to be chosen based solely on the scientific evidence backed up by demonstrable scientific rules and supported by science that complies with the rules in the new construction industry without relying on any idea of inventors, specialists or any negative influence from bureaucrats. Scientific evidence has always been the basis for GIKEN’s work. From an early stage in our history we have been calling for “Construction Revolution” and pursuing the “Five Construction Principles”. 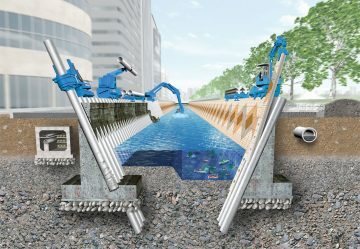 This has culminated in our call for the “Implant Structure” to replace the “ills” of the “Footing Structure”—currently the most widespread construction method—as the basis for all construction projects, recognising that a revolution in construction cannot take place without a revolution in structures. The ills of the Footing Structure refers to the fact that the footings, which always occupy large space, are positioned at the very bottom of the structure, increasing the work apace required. In addition, more than twenty procedures are involved, most of which entail unnecessary temporary works. The Implant Structure, on the other hand, essentially requires no temporary work, the work area is limited to the width of the construction machine, and the wall and foundation can be constructed and completed from ground level at the same time. This makes the implant method fundamentally superior, in that it involves the smallest number of procedures and realises a new concept, “Revolution of Principles” backed up by scientific evidence. The old construction industry is beset by emphasis on cost effectiveness. Apart from the drawbacks of the principles employed, however, it is unable to provide a lower cost solution. First and foremost, an Implant Structure requires no temporary work. It is said that, 70% of the work is categorised as temporary one with regard to the majority of river embankment projects, so this means that 70% of the cost can be saved by switching to the Implant Structure. At the same time, construction should not be just about cost. Our society must evolve toward a recycling society by respecting the Five Construction Principles. Permanent concrete structures, which are currently the mainstream, conflict with the Five Construction Principles and leave a significant negative legacy to future generations. The type of “Functional Structure” proposed by GIKEN, using Implant Structure, adapts flexibly to our evolving cultures and societies, provides the required functionality for a required term, and alters the shapes and functions of structures flexibly according to the needs of the era. We call on society to focus on providing the required functionality for the present rather than forever. Smarter and more aesthetic construction can be realized by adopting Implant Structure and its freedom of choice it provides. Realising a revolution in structures, and consequently a revolution in construction solution, must stands entirely on fundamental principles we propose and scientific evidence. GIKEN will keep standing at the forefront of this process of “scientific validation.” We hope we enlarge the supporting ring of the revolution worldwide.